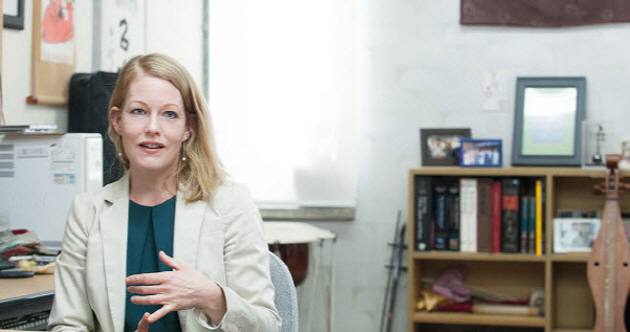 Although she majored in music for her undergraduate degree in 1992, due to its stressful environment, Professor Hilary Finchum-Sung (College of Music) hoped to study anthropology of the social sciences in graduate school. Eventually she decided to study ethnomusicology, a fusion of anthropology and music. After she had begun her masters, a professor who studied Korean folk music recommended to her to listen to Korean classical music. Professor Finchum-Sung had had little exposure to Asian music, let alone South Korean music, and since this was a time preceding YouTube, her first encounter with Korean classical Music began with three CDs that she bought from a bookstore. She recalls her surprise the moment she first heard it, “The music was vibrant but simple.” Ever since this initial introduction to Korean classical Music and completing her masters in 1997, spurred by her curiosity and a recommendation, she spent the next 18 years dedicating herself to this field. During her research in graduate school, Professor Finchum-Sung came across many articles that proposed that Korean classical music was unpopular among Koreans. She notes, “The region that I was born in had its own traditional music. Growing up in Nashville, Tennessee, people preferred classical music and was reluctant to admit that they enjoyed the region’s music. However, during my graduate studies I realized the importance of music related to my identity.” She believes that the traditional classical music of each country contains a unique national identity, so she feels that it is important that people explore this identity even if it may be unfamiliar at first. She says, “To claim that one doesn’t like Korean classical Music because one is unacquainted with it is wrong.” She analyzes the unpopularity of Korean classical music among contemporary Koreans, and hopes to develop strategies that may resolve this issue. Her ponderings on identity goes beyond her field of study. At present, Professor Finchum-Sung specializes in the theory of national classical music. 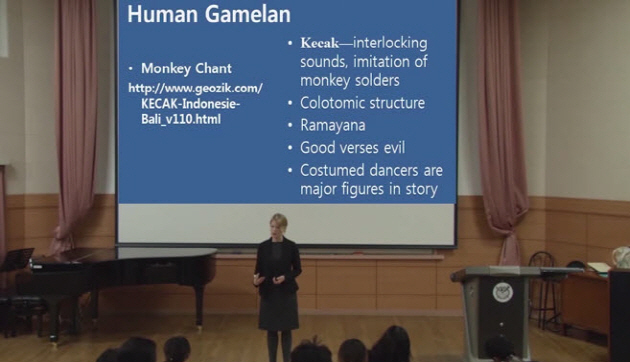 Ethnomusicology, which she studied in graduate school, involves differences in both research areas and methods. Therefore she has much experience with field surveys of the region related to the music. She stressed the importance of ethnomusicology even though it is currently a somewhat unfamiliar concept in Korea. She then discussed the lens through which she viewed Korean classical music. “I have only experienced Korean classical music for 18 years. I was unfamiliar with this music during middle and high school. Since I was not exposed from an early age, I have a different perspective on the music. I believe this is an advantage.” Currently spending a year on sabbatical leave, she is focusing on writing on the education, composition, and trends of Korean classical music, and is studying how this music has changed over the past 20 years, and contemplating its future direction in the 21st century. She is also researching intangible cultural assets and carrying out field surveys of certain regions. As she’s interested in female folk songs, she visits villages to conduct interviews as part of her on-site investigations. After she received her Ph.D. at Indiana University (2002) and did her post-doctorate at UC Berkeley (2002-2003), she lectured at the University of San Francisco. 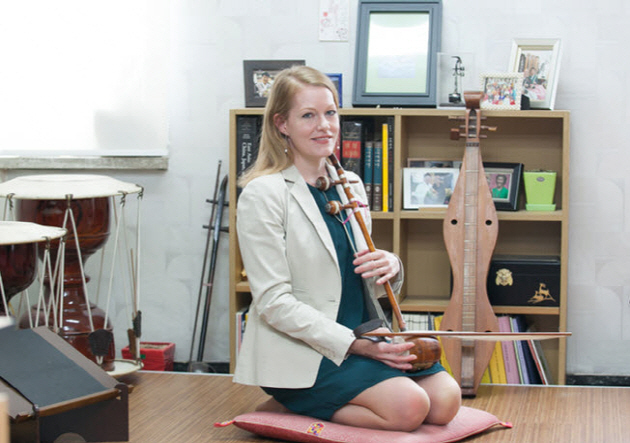 During this time, she received an email from her colleague who informed her that the Korean classical music department of Seoul National University had an open position for an international professor, and subsequently applied for it. She was appointed as a professor in 2009 at SNU. As a mother, much difficulty lay in store for her during her move to Korea. With language and cultural barriers, she initially had trouble settling in. But after 6 months, and efforts on her part, such as speaking Korean at home, she gained relief as her Korean improved. It has since been six years, and today she jokes that she speaks better Korean than English.